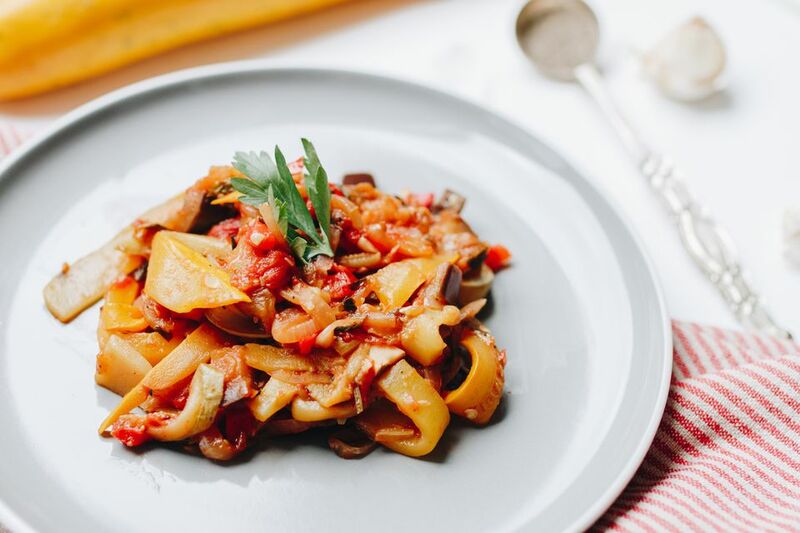 Ratatouille is a traditional vegetable stew which originated as a poor man’s dish in Nice. That may well have been its humble origins, but the stew has gone on to be known and loved, around the world and can hardly be considered as food for the poor today, though it is still a relatively cheap food if the vegetables are bought in season. It is imperative when making this dish to ensure you stick to its roots in the south of France where peppers, tomatoes, and garlic all grow in abundance. Use any color bell peppers you prefer, from brown to green, and anything in between. Also, use only good quality olive oil (if you can get French extra virgin oil from Provence, even better though not imperative) as this contributes to the overall flavor of the dish. The danger with cheap oils, especially those not from France, is they can taint the taste and the dish will also lack authenticity. This version lightly caramelizes the onions and peppers before adding them to the rest of the dish, giving it a fantastic complex flavor without much additional effort. Finally, one of the secrets to making a perfect Ratatouille is, do not stir too much or overcook so all the vegetables merge. Place a single layer of paper towels on 2 large plates. Place the cubed eggplant onto the plates and sprinkle with 1 3/4 teaspoon salt. Allow the eggplant to sit for 20 minutes. ; this is known as degorgement, which means the salt disgorges any liquid in the eggplant which is absorbed by the paper and makes the dish less soggy. In a large saucepan, gently cook the tomatoes, garlic, black pepper, basil, and parsley, uncovered, over medium heat. Do not boil the vegetables as this will turn them into a soggy mess, the vegetables cooked slowly will keep each of them distinct. In a large skillet, sauté the onions and bell peppers in a small amount of olive oil over medium-high heat for 10 minutes, stirring occasionally, until the vegetables are lightly browned. Remove the skillet from the heat and transfer the browned vegetables to the tomato mixture. Pat the eggplant dry with a fresh paper towel and add it, along with the zucchini to the tomato mixture. Cover the pot and cook the stew over low-medium heat for 45 minutes, until the vegetables are tender. Add the white wine and 3/4 teaspoon salt and cook for an additional 5 minutes.